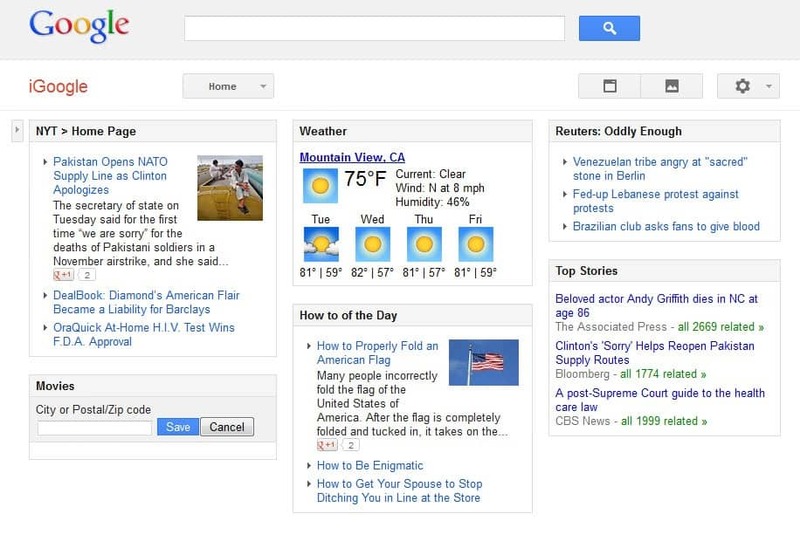 Google announced back in July 2012 that it would retire its personalized homepage service iGoogle on November 1, 2013. The customizable startpage on the Internet enabled users to create their own personal homepage that they could fill with contents of interest. Users had options to add gadgets to the startpage, including weather widgets, RSS feeds or a photo viewer and also to change the default theme to a custom one. If you try to open the iGoogle website today, you will notice that you are automatically redirected to the Google homepage. The service has been shut down and any attempt to open its main page or a sub-page will result in the redirect. With that said, it is also worth mentioning that Google is in the process of deleting all user data associated with the iGoogle service. If you missed the deadline and have not exported your data to your local system, you have no option whatsoever to do so now that the service has been shut down. Only data that you have integrated into iGoogle from other services, for instance Gmail or Google Calendar, are still available as you can still access it when you open the products directly in your web browser or application of choice. The shutdown is the second high profile product that Google shuts down this year. The shutdown of Google Reader strengthened third party services and it is likely that the discontinuation of iGoogle will do the same for third party personalized homepage services. We have reviewed several alternatives to iGoogle in the past, including long standing services such as Netvibes but also new services like Backstit.ch that were created as a response to Google's announcement. There have not been as many announcements of new services as was the case when Google confirmed the closure of Google Reader. This can be partially explained by the dominance of Google Reader in its field, while iGoogle had always stronger competition in the form of Netvibes and other services. It remains to be seen what users of iGoogle will do now that the service has been shut down for good. Some will likely stop using personalized startpages while others may migrate to services such as Netvibes or Backstit.ch instead which offer a similar feature set (some would say advanced). Google's main drive in recent time seems to be the focus on its strongest products only, and to either shut down those that do not meet certain criteria, or to integrate them into the company's Google+ service. While it is unlikely that we will see a resurrection of iGoogle in some form on Google+ or as part of Google Now, it is still possible that the company will introduce such a chance at a later point in time. Anyway, I have changed last week to http://startme.com and it works even better and faster than iGoogle, so I’m not too depressed about this after all. A shame. It was a good product, but I suppose they are shifting their focus to mobile? I have waited until the very end but had an alternative waiting. Changed my browser home page this morning. It will be missed. Agree with you there, not so many people seem to know about it though! RIP iGoogle. It just doesn’t make sense, but we ought to expect the big G to pull the rug out from under us by now, once we get accustomed to something nice. I’m trying out protopage, and I gotta say it’s pretty nice. The coloring options (specifically: the ability to have a nice dark page with light fonts) are amazing and the layout is very iGoogle style. Adding RSS feeds on it is a janky process, though, and the pre-made selection of widgets is just lacking and sad. All in all I think if you don’t mind manually adding your old RSS feeds to it, it is one of the better options going. igHome is alright, but I don’t like the coloring options nearly as much. Kind of a dealbreaker. -Click “add widgets” at the top left. -Drag the widget window that pops up to your page. http://www.google.com/ig/settings still allows you to export your settings to your desktop, but it might not be up for much longer. If you never heard to export settings (like me), this is your chance to do so now! The XML file can be read in notepad and from there it isn’t too tough to pick out the URLs for your iGoogle widget RSS feeds. Some won’t port well, (Slashdot URL from iGoogle settings didn’t work on protopage for me) but most do just fine. I used iGoogle everyday for the past 6/7 years! I have found a great alternative though in http://www.ustart.org it looks practically the same (albeit with less functionality) but overall you can adapt it to look very similar to your old iGoogle page :). No! I was going to start using it today. Didn’t know about this. Oh well, will check out the link by Jolanda. I’ve been using it for a couple of weeks now, it’s fast to load, customizable and does pretty much everything igoogle used to do! 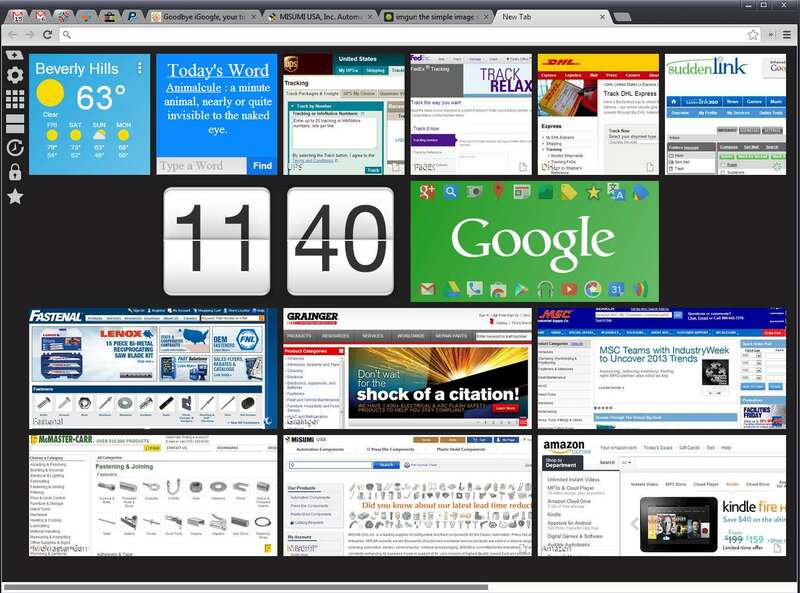 I’ve found the “Awesome new tab page” extension for Chrome to be a great replacement. it allows a widget like interface with customizable links to whatever websites you like (along with some search functionality for most sites). And as it doesn’t load from a 3rd party server. Plus it has tons of customization. Stinks for people that use it, but at the same time, I’m kind of glad Google is continuing this trend of cutting services. It just pushes people to other non-Google things, inspires people to create alternatives, and generally is slowly creating resentment for Google. Closure by closure, piece by piece, Google is moving their way to destruction. And since they decided to change their motto from ‘Don’t Be Evil’ to MONEY MONEY MONEY and are clearly colluding with the NSA and any law-enforcement group that wishes to trample upon individual liberties (although of course they deny it, who wouldn’t? ), I couldn’t be happier. Martin, what do you think of http://www.hinto.co as an alternative to the now gone iGoogle? Thanks. Have you tried http://startific.com ? startpages out there. Not your average startpage, and definitely a great user interface. Yes igoogle is shut down last few days but now i am using the startme. It is the best alternatives of iGoogle and easy to use as well as you can also find the more from igooglealternatives.info . I am also using http://startme.com and I am happy to see other people recommend it. I find it very intuitive and it gives me a very easy way to put in one page everything I use. Another good feature for me is that you can set it up in many languages, so I could recommend it to friends and family abroad that were looking for an alternative. Another http://www.start.me user here. Now that we’re a few months down the road, I can say that I haven’t regretted the switch one moment.